Originally formed by pianist and composer Michael Garrick MBE, who sadly passed away in 2011, The MJQ Celebration had been delighting sell-out UK audiences with their fresh interpretations of the pioneering 1950s/60s sounds of the Modern Jazz Quartet. Determined to continue the success of the project, and in Michael's memory, the friends are now touring again as a new line-up, launching this engaging debut release. 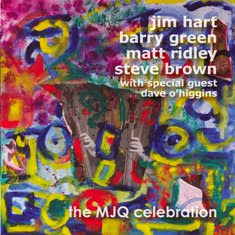 Combining their evocative MJQ reworkings with three characteristic Sonny Rollins numbers, as well as fitting tributes to their founder member, the present quartet of Jim Hart (vibes), Barry Green (piano), Matt Ridley (bass) and Steve Brown (drums), plus tenor saxophonist Dave O'Higgins, demonstrate their supreme qualification in perpetuating the spirit of Milt Jackson, John Lewis, Percy Heath and Connie Kay. Impressively – testament to their calibre and the understanding between them – the whole recording of some sixty six minutes was captured, without overdubs or edits, in a single day. Key to the authentic MJQ sound is the sustained yet athletic vibraphone of Jim Hart, a hugely accomplished and popular ambassador for his instrument; and, opening with John Lewis's The Golden Striker, the bright, jingling atmosphere is immediately established. The double bass versatility and compositional talent of Matt Ridley were confirmed in his 2013 debut album Thymos – here, that same expertise and clarity drive the quartet along, Milt Jackson's Bluesology swinging infectiously, and pacier than the original. More than sixty years on, Lewis's Milano is as nimble as ever, particularly when, midway, the metre is picked up so cheerily. And, with more awards over the years than you can shake a couple of sticks at, Steve Brown's customary enthusiasm is perceptible throughout, the solidity and intricacy of his drumming shining through. In the first of the Rollins interpretations, The Stopper, Brown is a fantastic rhythm-maker for seasoned tenorist Dave O'Higgins, the playful stop/start tempo and fast swing suiting his instinctive, sharp, drum technique. A sublime quartet arrangement of Michael Garrick's jazz orchestra piece Lady Of The Aurian Wood chimes serenely to Hart's vibraphone; and the late leader's worthy successor, Barry Green, adds his crystalline piano to its shimmering, held-back elegance. Readings of classics Concorde and Django are finely observed; in the latter, the reverential, Bachian piano/vibes character so closely associated with Lewis and Jackson provides the prelude to that familiar MJQ sway, Green's bluesy piano breaking out with joyful abandon. No Moe and Scoops further celebrate the exuberance of Sonny Rollins' style (the link being the collaborative MJQ/Rollins album of 1956), Hart and O'Higgins effulgently soloing over Ridley's and Brown's 'conversations'; and Michael Garrick's Promises romps along excitedly – a great showcase for all five players. Further pleasures amongst this thirteen-track treasure trove include Jim Hart's immaculately-weighted lead in Earl Brent and Matt Dennis's Angel Eyes, plus a perky, breathless take of La Ronde. The whole programme concludes with a much-loved favourite, Milt ('Bags') Jackson's Bags' Groove, its seven minutes brimming with this quartet's affectionate exaltation of their iconic predecessors. An enormously entertaining project, already leaping on top of an early 'best of 2014' pile.